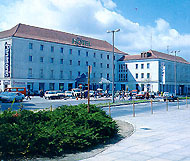 Gromada Hotel is situated in the city centre, 500 m away from the main railway station and 300 m away from the main bus station. We offer single, double rooms and suites. All rooms are equipped with a TV, a bathroom and a shower. To our guests disposal are: 3 conference rooms and a sauna. We organize trips to and outside the city. The region is covered by forests and interestingly shaped landscape which enable walks on marked tracks.